After carefully analyzing input from former students, members of the law enforcement community, and other professionals who use unmanned aerial systems (UAS) in their day-to-day jobs, UD PCS has revamped our drone training program to provide in-demand, multifaceted training at the best possible value. Our new drone training offerings provide comprehensive UAS training to drone novices and advanced users alike. Whether you are a beginner who is seeking FAA Part 107 pilot certification or an advanced pilot responsible for lifesaving tactical missions, we have a drone training course that fits your needs and skill level. Designed to be completed over a single weekend, each of our drone training courses provides industry-leading instruction and features highly qualified UAS experts with extensive flight experience in practical applications. Because of the tremendous opportunities for growth in employment associated with commercial activities of the UAS, a workforce of about 400,000 is being created in just a few years. REGISTER TODAY FOR JUNE CLASS! Legally flying a drone for commercial use requires an FAA Part 107 remote pilot certificate. During this intensive course, flight instructors provide comprehensive classroom training and prepare drone pilots for the Federal Aviation Administration’s airman knowledge test, which must be passed to earn the certificate. Topics include regulations, airspace, weather, loading and performance, and operations. REGISTER TODAY FOR MAY CLASS! Ready to fly your drone? Learn the basics of flying small unmanned aircraft systems (UAS). Topics include familiarization with various aircraft and system components, basic flight planning, safe flight deck setup and operations, basic flight maneuvers, emergency procedures, autonomous flight mode options, multi-aircraft mission design, and effective programmatic record keeping. Students will become familiar with and receive individual hands-on flight time with a variety of aircraft systems, such as the DJI Mavic, DJI Phantom 4 Pro, DJI Inspire I, and DJI Matrice 200. The following intermediate and advanced programs are only available via customized group training. Please submit the form at the bottom of this page to inquire about training for your group. Learn the basics of performing industrial inspection and aerial mapping utilizing small unmanned aircraft systems (sUAS). Topics include familiarization with various imaging payloads, inspection reporting, basic flight planning, safe flight deck setup and operations, basic inspection skills with both visual and thermal imaging solutions, various mapping applications, and basic thermography skills. Learn the basics of capturing stunning images from above using Unmanned Aircraft Systems (UAS). Topics include familiarization with various aerial imaging systems and components, UAS imaging settings, basic photography and videography skills, as well as basic UAS flight planning and safe flight operations. Students will become familiar with and receive individual hands-on flight time with a variety of aircraft systems, such as the DJI Mavic, DJI Phantom 4 Pro, DJI Inspire I, and DJI Matrice 200 series. For advanced drone users, the following courses require an FAA Part 107 remote pilot certificate. In this intensive two-day, hands-on course, operators will become proficient on the DJI M210 platform (the No. 1 multipurpose industrial-grade drone serving both first responders and companies); the X4S, X5S, Z30 and XT payloads; DJI flight control software, Pilot App; and safe flight maneuvers for failsafe situations. Want to run a drone fleet in your organization? UAV are only a small piece of a drone program. Along with having technical proficiency, managing a fleet of drones requires an understanding of federal, state and local laws and regulations. This course covers the many aspects of program management that must be addressed prior to launching a program, and also maintaining it once it begins operating. Intended as a starting point for the creation of a successful drone program, students will receive hands-on knowledge of the DJI Flight System via Drone Program Point Person (D3P™) training. Students learn the basics of night operations and thermal imaging utilizing small unmanned aircraft systems (UAS). Led by certified thermographers, this course provides an overview of regulations pertaining to flying UAS after dark, discussion regarding how to perceive the operating environment safely during nighttime operations, and lessons on the fundamentals of accurate thermal imaging and data interpretation. Various aircraft (such as the DJI Mavic, DJI Phantom 4 Pro, DJI Inspire, DJI Matrice 200 and DJI Matrice 210) are used during individual hands-on flight training sessions. All of our drone pilot training courses can be conducted on-site at your place of business. 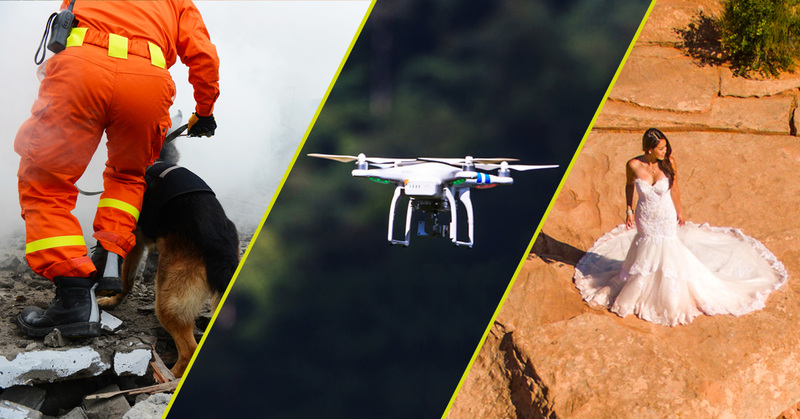 In addition, we can create a customized drone training program based on your needs. For more information or to request a proposal for on-site training, please contact us via the form below. Professional Drone Pilot Training programs are conducted by FAA-licensed unmanned aircraft pilots from Adam Ringle Consulting (ARC), a Delaware-based industry leader in UAS training.